The past month or so I've been deep in cult land. More specifically I've been researching the Mormons. Other than a few stories that Shewho told me of her Mormon upbringing in Southern California, as a young virgin baptizing the dead, I didn't know much. I'd seen Season 7, episode 12 of South Park, "All About Mormons," which does give you a great synopsis of the Mormon religion creation myth, but that was it. Then, as I followed Osterhouts between NY and Pa., across the country in ox trains during the 1850's, Mormonism popped up repeatedly. There's a reason the South Park guys wrote a hit musical devoted to The Book of Mormon. It's really funny and just as unbelievable as any virgin birth or rising from the dead narrative. So yesterday I jumped in the car and headed west to the birthplace of Mormonism. No, not Salt Lake City. Ground zero for The Book of Mormon is less than 100 miles from my house in the little town of Harmony, Pa. Nobody but a Mormon or a historical geek like myself would know this. Between Deposit and Binghamton there's the little town of Windsor, NY. It sits where the ancient Indian settlement of Oquago sprawled out on both sides of the Susquehanna for miles north and south. If you take Rt. 79 north you'll travel literally through a tunnel of corn, stretching as far as the eye can see. Old generational dairy farms dot the landscape planted along the rich flood plain. It's spectacular and at the same time grimy, and depressed. Head south and the bottom tightens, the river passing though pine forest and rocky escarpments, canoes and old speedboats tucked in crumbling stone foundations now used as parking spaces. Until 1779 this was the breadbasket of the Iroquois Confederacy, the southeastern border of their central and Pa. domain. Our old friend Gen. John Sullivan and his scorched earth expedition took care of the Onondaga and Tuscarora tribes that were the former residents, killing or driving them off. The rich soil and two major river systems, the Susquehanna and Delaware within a few miles of each other are the reason this strategic spot was so important three hundred years ago. Now it's all but forgotten. The fact that the Natives controlled it was untenable for so-called "civilization." I give this as way of backdrop to the place that birthed Mormonism. If you watch the South Park episode it will tell you all you need to know about The Book of Mormon. As I stood in the very spot that Joseph Smith, his wife Emma Hale, and some co-horts "translated" the book from the magical golden plates, I wondered if my guide Abne had seen the episode, or if he held any doubt in his mind as to the truthfulness of the myth. As he went forward with his well rehearsed "love story" of Emma and Joseph, I interjected with a few specific questions of my own. He looked at me in surprise. "How do you know so much about Mormons?" I explained my scholarly interest and informed him that the Osterhouts were in fact neighbors of the Hales in the 1820's, as the man who he revered and I viewed as little more than a charlatan and con man, founded his world wide cult. There is little doubt Peter Osterhout met Joseph Smith. If I had wished I could've turned the tables on Abne, and worked my magical missionary ways on him. Which would you prefer, a belief system based on fantasy that requires you tithe 10% of your income and believe Jesus lived in upstate NY or one that asks only you burn a couple of dollars per year and believe whatever the hell you want? Plus we have supermodels. But I didn't bring it up. Poor Abne was on his own. I drove home to Shewho's who is a little twitchy about my recent interest in a religion she's spent all her adult life trying to forget. I told Sister Shewho she had nothing to fear. I'd come up against Jim Jones' murderous aftermath, attended seminary, started my own church without drinking the kool-aid. So we spent the evening watching a documentary on Scientology, eating pot candies and re-watching the Mormon episode of South Park, laughing our asses off. I had asked Abne if he had experienced any anti-Mormon animosity in Harmony (Oakland), Pa. He just shrugged his shoulders and sighed, admitting that it wasn't always easy being a Mormon. And here's where I really felt for the guy. I have nothing good to say about Jim Jones, Joseph Smith or L. Ron Hubbard, but their followers I sympathize with. They are deluded by theologies that seem to spin out of control, sucking the ungrounded and susceptible into their gravitational pull, and they can't get out. I want to help. The hillbilly signage, just down the road from the Mormon visitor's center in Harmony says it all. 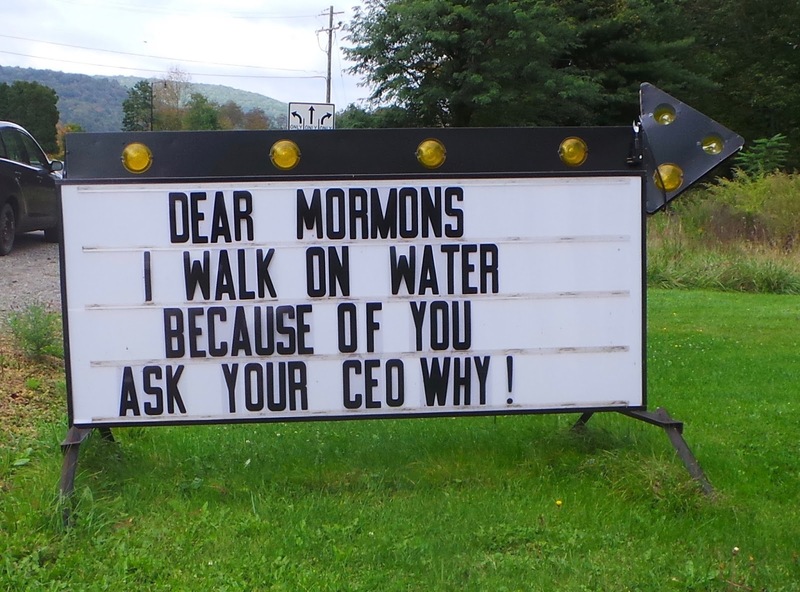 "I walk on water because of you." On the reverse side it advertised a Wed. night special at the local bowling alley. Take a Mormon bowling. Maybe that will help.